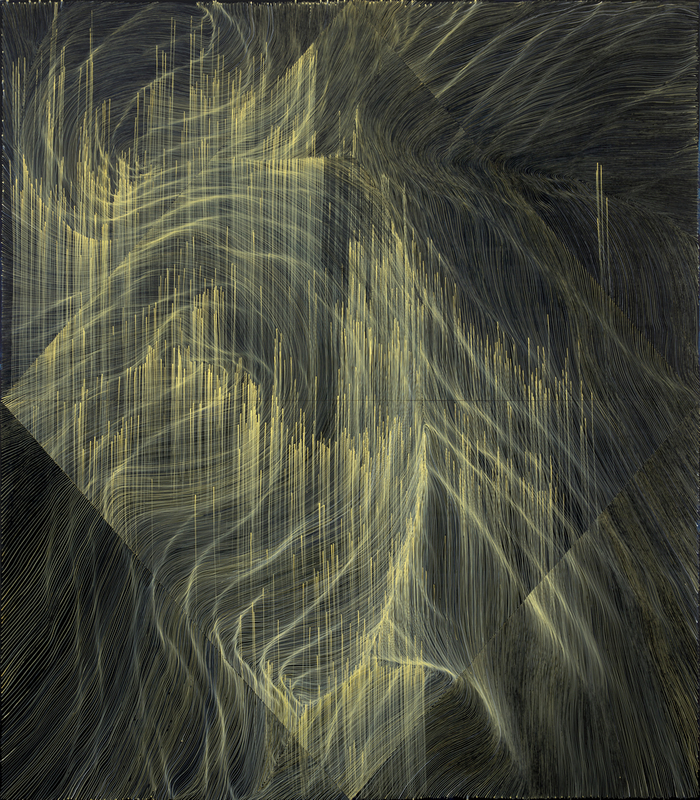 Linn Meyers' (b.1968, Washington D.C.) works are physical manifestations of movement. Through repetitive sequences of dots and lines within close proximity, Meyers' works mimic the movement of time, of nature, and of space. The basis of any image begins with a single point. A single point lacks meaning, but in relation and by association to another, it becomes a part of a collective—a line. In this way, Meyers’ process is an intuitive one. She constructs her image with a ‘matrix’ that serves as a basis for the structure of her image, which she then fills with corresponding dots and lines. The structure of her works is geometric and meditative, but the form of her image occurs organically and intuitively. Certainty exists in structure but uncertainty dwells within its forms. With every point, with every line she makes, she begins her process all over again. This accumulation of process is what creates the image. This recurrence is what gives dimensionality to her works, which then creates a physicality to a two-dimensional plane. Meyers’ works are inherently flat, as she often works on Mylar and panel, but through process she creates an illusion of depth. Meyers also constructs site-specific drawings, inducing works that immerse the viewers into her creations. The ephemeral nature of her site-specific drawings emphasizes the fleeting nature of all things, but also emphasizes process—the exploration of her ‘body through space.’ There is a subtly and ephemerality within her works that reveal and reflect the paradox of human existence. As no hands can mimic the perfect line or the perfect circle, the non-linear nature of her works lingers within the imperfections of human existence. Born in 1968, Meyers earned her BFA from The Cooper Union, New York, NY, and later an MFA from California College of the Arts, San Francisco, CA. Meyers has shown her works internationally for more than twenty years, of which solo museum exhibitions include The Phillips Collection in Washington, D.C., The Hirshhorn Museum and Sculpture Garden in Washington, D.C., and The Hammer Museum in Los Angeles, CA., among others. Her works are included in the public collections of The Hirshhorn Museum and Sculpture Garden in Washington, D.C., Smithsonian American Art Museum in Washington, D.C., National Museum of Women in the Arts in Washington, D.C., Washington, D.C., The Phillips Collection Washington, D.C., The Hammer Museum in Los Angeles, CA, and more. Meyers currently lives and works in Washington, D.C. 거대한 벽을 마주하고 점과 선으로 하나하나 채워나가는 작가. Meyers는 기술적 도구 없이 작가 자신의 손으로 점과 선을 차례차례 그려낸다. 마치 자연의 순리를 따르는 것처럼 언제나 앞의 점이 찍히고 다음의 점이 생성되며, 선행한 선 다음에 다른 선이 새겨진다. 작가의 시간과 노동이 응집된 물리적 손 끝에서, 자칫 무의미해보이는 개별 요소인 점과 선은 다음 순간 전체의 장대한 화면을 구성해낸다. Meyers가 아로새긴 이미지는 작가의 신체적 움직임, 소요된 시간, 과정 속에서 스쳐간 상념들을 근사하게 시각적으로 구현해낸다. 끊김없이 요동치는 선과 점을 바라보며 혹자는 어떤 지형을, 물결을, 그리고 바람을 발견할지 모른다. 유연한 이미지의 흐름이 자아내는 일종의 환영을 통해 공간을 가득 메우는 작품은 언제든 다시 보고, 새로운 요소를 발견하며, 몰입할 수 있는 가능성의 장소로 재탄생 된다. Meyers의 벽 페인팅 프로젝트의 가장 큰 특징은 ‘장소 특정적’이라는 것이다. 작품은 해당 공간에 맞추어 기획되며, 때로는 공간 전체를 둘러싸기도 한다. 작업은 기본적으로 기획을 따르지만, 작가가 특정 공간에서 오롯이 시간을 보내며 제작하는 과정을 거친다. 어떤 도구적 도움없이 벽을 대면하고 그려지는 유동적인 선과 점은 공간과 공명하며 이미지로 나아간다. 그 과정에서 선은 균일하지 않고 율동감 있는 두께를 지니며, 완벽한 원으로 찍히지 못하는 점도 작품으로 포용 된다. 완성된 페인팅은 작가의 신체적 에너지와 생각의 흐름, 조형 요소와 공간의 상호작용이 응집되어 있다. 화면은 생동하는 에너지를 분출하며, 감상은 능동적인 경험이 된다. 각자 적극적으로 이미지를 발견하고, 벽면을 따라 걸으며 커다란 작업을 조망하면서 신체적으로 작품을 수용하게 되는 것이다. 이처럼 벽 페인팅은 전시 공간, 제작에 쏟아낸 작가의 신체, 그리고 동적인 감상이 어우러지며 신체적인 순환을 거듭한다. 장소 특정적 작업들은 전시가 끝나면 페인트로 덮여 사라진다. 마치 작품 자체가 수명을 지닌 유한한 생명체인 것처럼 이별을 고하는 것이다. 소멸의 과정은 생성의 과정만큼 중요하며, 덧없는 일시성은 마치 우리가 살아가는 현대에 대한 고찰 이자 만물의 가변적인 본질에 대한 작가의 날카로운 스케치처럼 느껴진다. Linn Meyers는 1968년 출생하여, The Cooper Union, New York, NY에서 BFA를, 이후에는 California College of the Arts, San Francisco, CA에서 MFA를 취득하였다. 20년 이상 국제적으로 활동하며, 다방면에서 개인전 및 여러 전시에 참여하였다. 주요 전시로는 The Phillips Collection in Washington, D.C., The Hirshhorn Museum and Sculpture Garden in Washington, D.C., and The Hammer Museum in Los Angeles, CA. 등의 미술관에서 진행한 개인전이 있다. Meyers의 작품은 The Hirshhorn Museum and Sculpture Garden in Washington, D.C., Smithsonian American Art Museum in Washington, D.C., National Museum of Women in the Arts in Washington, D.C., Washington, D.C., The Phillips Collection Washington, D.C., The Hammer Museum in Los Angeles, CA 등지의 퍼블릭 컬렉션에 소장되어 있다. Meyers는 현재 Washington, D.C.에 거주하며 워싱턴을 기반으로 활동하고 있다.